There's a bunch of stuff we'd like to announce for release in June and July. Ready? Good! It's a gameboard for Munchkin Cthulhu and Munchkin Zombies -- a dungeon room for every level, plus spaces for the decks and discards, so you can instantly see who's surging ahead recklessly and who's hanging back to eat your brains. Includes two sets of male/female tokens in six colors, and matching colored markers with special in-game bonuses for each player! 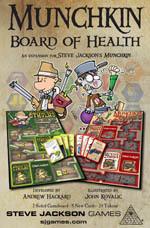 And you get eight brand-new cards, four for Munchkin Cthulhu and four for Munchkin Zombies! The giant tank rumbles toward its target . . . its guns are destroyed, its movement crippled, but only a few defenders are left. Will they stop the robot juggernaut, or will it crush the Command Post beneath its gigantic treads? 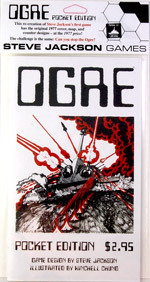 Ogre was Steve Jackson's first game. First released in 1977, it set a new standard for fast, exciting boardgame play. Over 25 years after its release, Ogre earned a spot in James Lowder's popular book Hobby Games: The 100 Best. In 2012, Steve Jackson Games launched the "Designer's Edition" of Ogre on Kickstarter. . . a 24-pound box with giant maps and several hundred counters, retailing for $100. Despite its "pocket" size, Ogre Pocket Edition will have more than enough counters to play all five of the "Ogre vs. Command Post" scenarios. It includes two different conventional forces (a Black force and a White force), with a whopping eight White Howitzers! That's a whole lot of gameplay for $2.95. 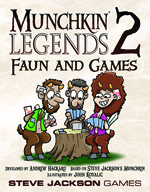 Faun and Games adds 56 more cards to the Munchkin mythology. You can use the Spear of Density to fight J.R.R. Trollkin, or fend off the Wendigo with your Hell Toupee. Play a new Race, the Faun, and caper out of danger . . . or into it! 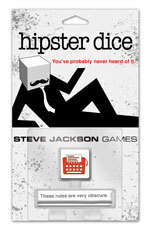 Based on the underground German phenomenon, Nichteinechteswürfelspiel, and updated with vintage rules, Hipster Dice is poised to be the perfect game to play while you're waiting in line at the second-hand clothes store. Get it before it's cool.